The latest project from Sheffield architectural design specialists CODA Bespoke which featured on Channel 4 hit Grand Designs has been named Residential Development of the Year at the prestigious Northern Design Awards 2018. The CODA Bespoke team, headed by by Associate Director Abel Hinchliffe, created a £610,000 double dream home for identical twins Nik and Jon Daughtry. Their vision was to take a 200-year-old corn mill site in the north Sheffield community of Oughtibridge and transform it into a pair of self-build properties that would retain original centuries old features at the same time as creating the perfect 21st century living space. And as well as winning the praise of Grand Designs guru Kevin McCloud it has now also beaten several multi-million pound projects to be named the year’s best residential development at the Northern Design Awards. 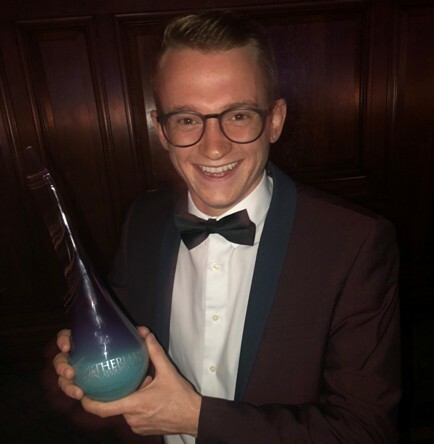 “We always knew that this was going to be a very special project but for it to have won this major award exceeds even our expectations,” said Abel, who received the prize at an awards ceremony at the iconic Principal Hotel in Manchester. “This was a great project to work on but one that came with a set of very specific challenges,” said Abel. “Not only was there the site’s past, which everybody was determined had to be preserved, but there was also the fact that we had to create two family homes in what is actually quite a small space. “We came up with a design that filled all Nik and Jon’s wishes, a brilliantly contemporary pair of properties that also pays tribute to the story of the site and, through the use of materials, to the bigger story of Sheffield’s industrial heritage.